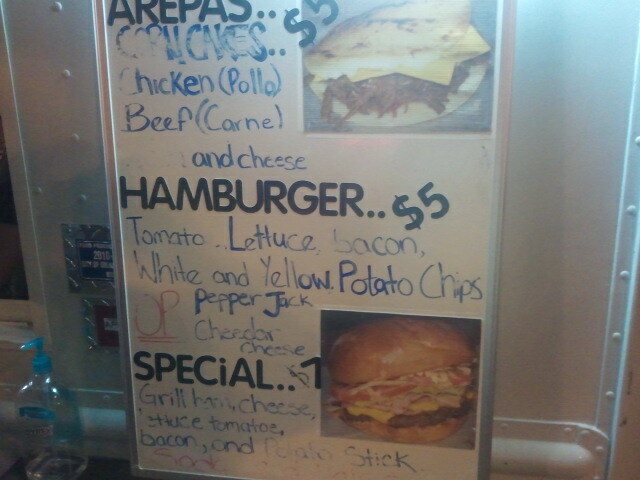 They are open Wednesdays through Saturday nights at Washington and court basically across from Gringos Locos. 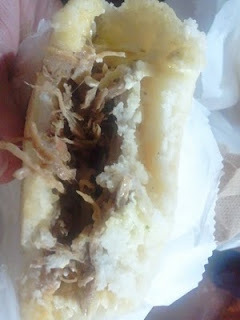 The Arepas($5) are filled with either shredded beef and cheese or chicken and cheese. The photo on their menu shows crappy American cheese but that isn't what they put on it, they use a white shredded type cheese. The Arepas themselves are white but not really sweet and they cut it in half to open it up like you would a pita and stuff the ingredients inside. They have 3 sauces in squeeze bottles you can put on as much as you like. Garlic sauce, Tartara and a Spicy one. I asked him a few times what peppers were in the spicy one but he just kept saying chili. All of the sauces had a similar white consistency but my fav was the garlic. The spicy one was good too but it wasn't very spicy just a little. 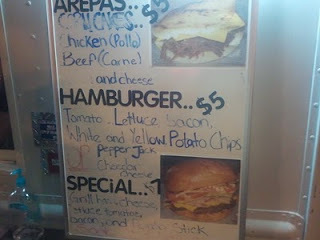 I didn't get to try the other 2 items but the Colombian guy working there said they were really good.